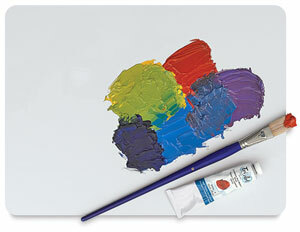 Tri-Art’s non-stick palette is perfect for the acrylic artist. Just peel off any dried acrylic paint to reveal a clean working surface. The palette can also be used for water-based and oil-based printing inks, tempera paint, oil paints, alkyds, and gouache; only acrylic paint will peel off, however. It’s lightweight, reusable, easy to store and will not warp or crack over time. Use it as an economical and environmentally sound alternative to disposable, metal, wood, or plastic palettes.